A few weeks ago I attended a great little workshop at the Institute for Environmental History at St. Andrews University in Scotland. The papers ranged from Mark McLaughlin’s investigation of the links between New Brunswick’s scientists and Rachel Carson’s Silent Spring to a provocative paper on the future of nuclear energy by St. Andrews’ Kirsten Jenkins. One that stood out as a great topic for my upcoming Otter post, however, was Benjamin Tendler’s presentation on the Environment & Society Portal. I’d seen a very short presentation on the Rachel Carson Center’s innovative website in Madison, but this time Benjamin had the time to show off a lot more features. 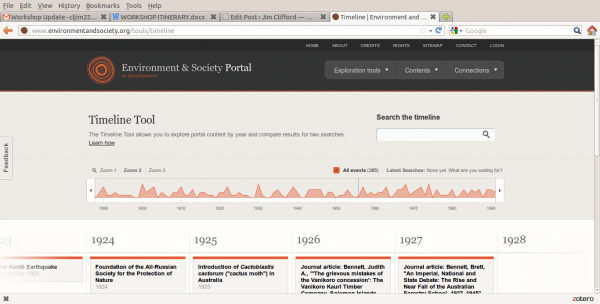 The Portal, like the NiCHE website, is built using Drupal and they’ve developed some really interesting features to allow visitors to explore environmental history content on the web. This includes material produced for the E & S Portal and other journal articles, webpages and podcasts aggregated from the wider web (including material from the NiCHE website). Along with the standard search box, visitors can explore the material through a map, a time-line or through connected keywords. The map pins material to locations on the map and allows you to pan and zoom to explore topics related to a particular country, region or city. The time-line provides a similar experience, allowing you to scan back and forward in time and to zoom in and out for more or less detail. Finally the Trace Connections option allows you to click through a range of connected ideas, moving from broad to more narrow, but related topics. The website is still in development and there are lots of gaps in the content. You can get involved with the project and volunteer to contribute content by getting in touch with the project team using the feedback form on the website.